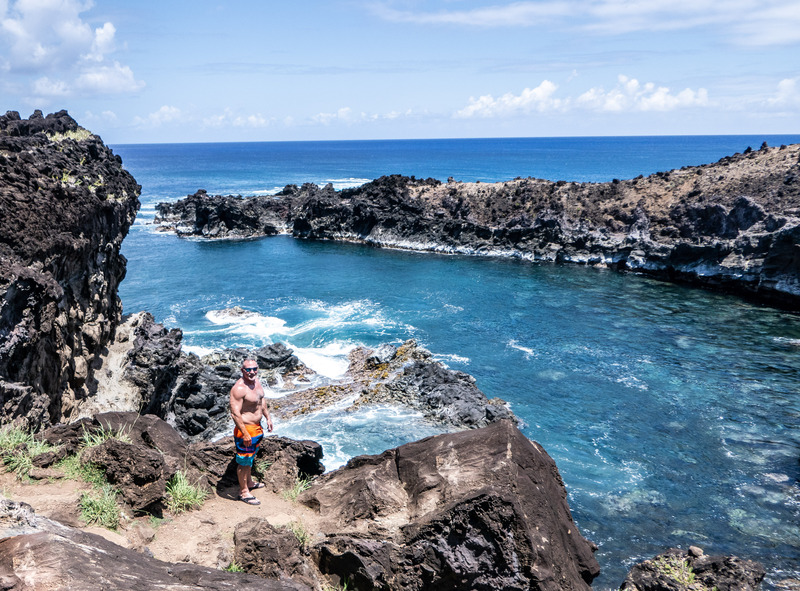 Rapa Nui is extremely isolated with one of the most remote populations in the world. At approx. 8 miles by 8 miles with just under 7,500 people, you’re in the middle of the Pacific Ocean with the next closest land being five hours away as the crow flies. The only flights in and out of the island are operated by LATAM Airlines, They offer once or twice daily service to Santiago, Chile depending on season. There is also a single flight once a week every Saturday late-afternoon departure that continues another five more hours west to Pappette, Tahiti in French Polynesia. 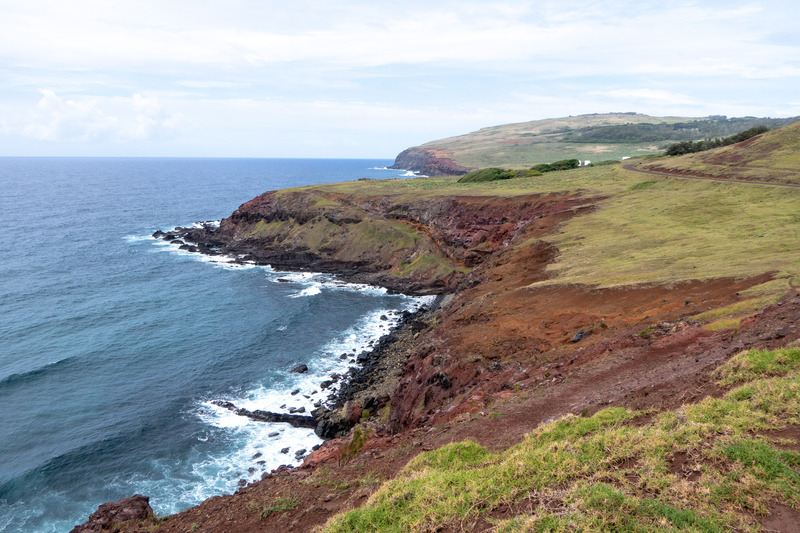 It then turns around and comes back, continuing through Rapa Nui and returning to Santiago. Television: Despite what you may read online, there is almost no connectivity on the island. There is one local radio station – “Radio Rapa Nui” – and no broadcast television. I’m sure some hotels may rebroadcast a handful of taped Chilean programs on a few “channels”, but our hotel had nothing. Just a hollow LCD TV on the wall w/DVD player in case you brought movies on physical media with you. Mobile Data: There are two mobile carriers on the island: ENTEL and Movistar. Both are Chilean based. While they have working roaming agreements with our USA-based carriers (Verizon, AT&T, T-Mobile, and Sprint) the real-life experience was different. If you can connect at all, you’re throttled. Even after resetting all networking, rebooting my phone two dozen times, I pretty much had 2G call and SMS text only service the entire time on my Verizon iPhone X. Nothing more. True data service was absent 99% of the time. The mobile signal is only in and around the capital of Hanga Roa. The rest of the island has no service at all. There were small intermittent bursts of 10-20 seconds, 3-4 times per day, where Facebook or Instagram would load and your e-mail would download, then everything quits. Some six or nine hours later another small window opens for half a minute then shuts back down. Uploading was next to impossible. The lesson here is to get printed maps, figure out your route plans, and plan out your communication and meeting up points before setting out each day. 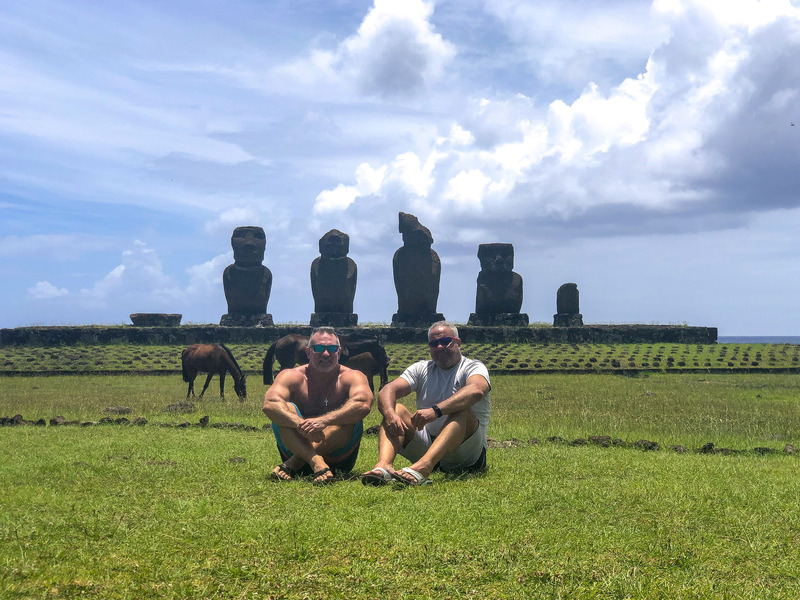 Set your expectation before arriving on Rapa Nui that you’re mostly disconnected, and you’ll be fine. Wi-Fi: There are locations around the island which are designated official free Wi-Fi zones, but they are few and far between and no instructions on how to connect could be found. I found two of them in Hanga Roa. Couldn’t connect at all each time. There was a single coffee shop, Tiare Coffee, that had free Wi-Fi. It was also the only place with iced coffee if that’s your thing. Add in some great outdoor seating on the main strip of Hanga Roa with a tasty omelet and you had a winner. Check it out. Our hotel had free Wi-Fi, but only in the hotel lobby not the individual rooms. Looking back at a couple places this was more common than not. Keep this in mind when you see “Free Wi-Fi” on your hotel booking. You probably won’t be lying in bed texting while scrolling through Instagram. You must run down to reception to do that on the sofa there. Weather: Our visit was in January 2019, the peak summer month of the year for the Southern Hemisphere. It was 75-80 degrees and sunny each day with periods of torrential downpour rain. The rain didn’t last long and was off and on two or three times each day and night. I’d even call it refreshing at times. The island has great breezes and winds, so we weren’t uncomfortable with no air conditioning. None of the accommodations in Rapa Nui have A/C. Well a few, but as a rule there are none. Just remember sunscreen, sunscreen, sunscreen. The UV index was ”11+” on the posted range of 1 to 10. You could feel yourself starting to burn each day. Reapply sunscreen a couple of times a day. If you need to buy it there, it is sold only in the pharmacy. That’s the green “Cruze Verde” building located in the center of Hanga Roa on the main road. Tour vs. Exploring: I’m a tour type person. Something about being show around is welcoming. We bought and paid for a group tour on Day 3 of our visit but wound up not going on it. 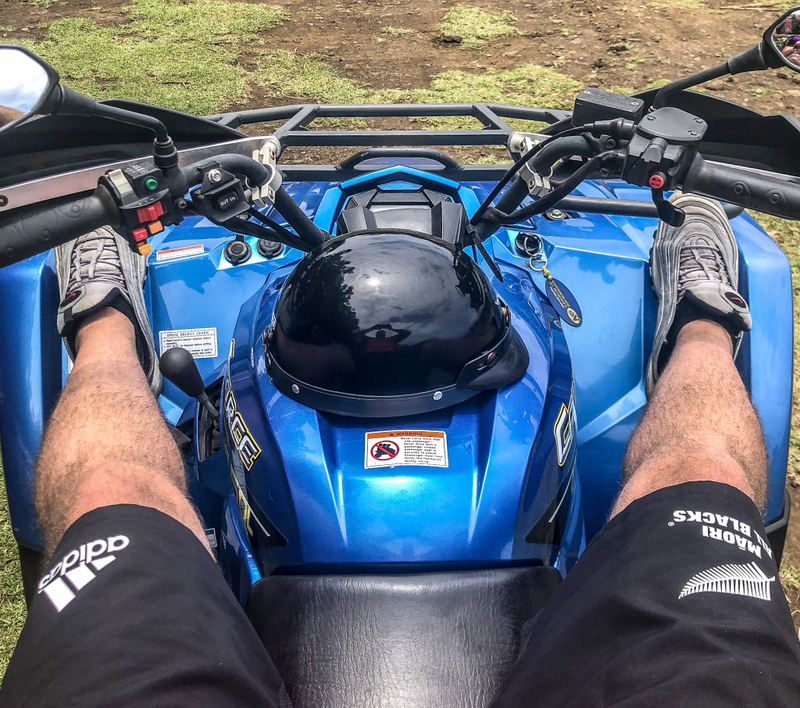 After getting a start without the tour that last morning, we realized taking our ATVs around to explore independently was a much better option. The tour isn’t going to tell you much you can’t read on Wikipedia and it’s full of people, so you’re stuck being shuttled from Maoi site to Maoi site on a bus and subject to their timeline. By Day 3, we felt comfortable showing ourselves around. It’s hard to get lost when there is only one primary ring road around the island. Using your own ATV to get around was much more freeing. We would see a couple of tour busses at a place and just pass by it, waiting for them to clear out later so we could go back and have it for ourselves. It worked out perfect. Language: You’re going to need rudimentary Spanish or at least travel with a person who does. Recall the sections above about lack of mobile data. If you’re going to rely on your phone for Google Translate, you need the app not the mobile site plus the off-line Spanish translation dictionary. 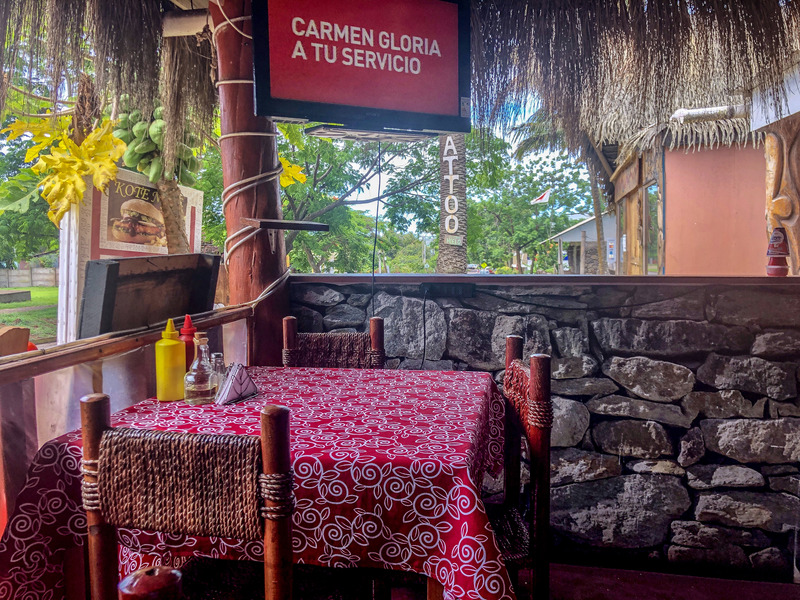 Yes, English is scattered throughout the island, but we got into a couple of tricky situations where people spoke less than conversational English and we needed to communicate with them with no other option but to use our Spanish. Keep this in mind. Day 1: Arrive at LATAM daily flight at 1 PM. Grab bags, get transportation to your hotel if they aren’t already picking you up with a sign and your name on it. Check-in your accommodations and get settled. Familiarize yourself with the layout of the town and make a quick trip to the market for snacks, water, and essentials. Hit the ATM as a handful of places require cash and you’ll need it in case the credit card networks are down. You’re in the middle of the Pacific – it happens. 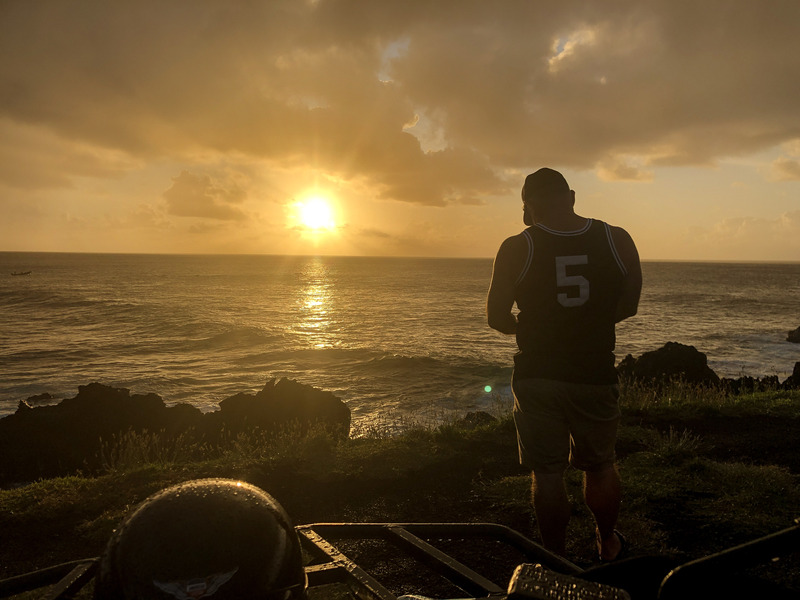 Head out to rent your vehicle of choice then find a nice sit-down place for dinner, followed by sunset watching at 9 PM with a crowd of people at a good viewpoint, and a little bit of late-day Wi-Fi before heading to sleep shortly thereafter. Day 2: Go find Tiare Coffee for breakfast and take your time. 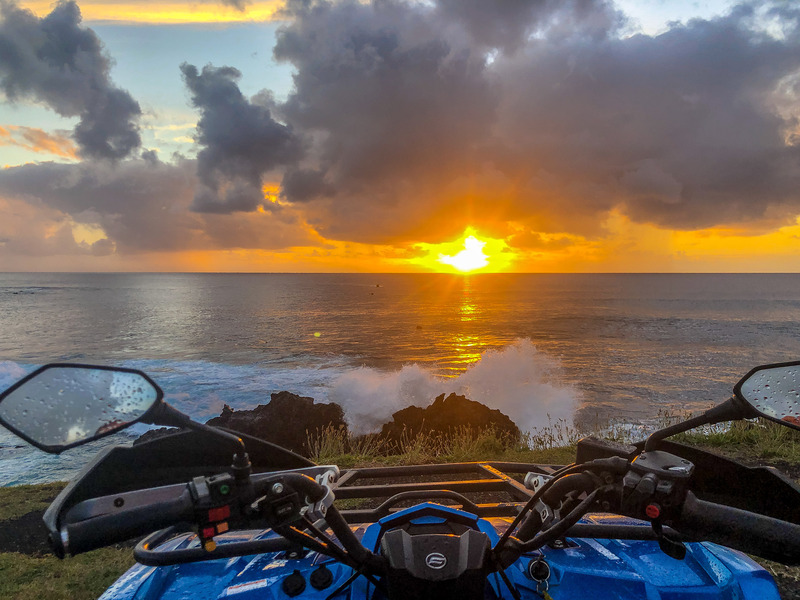 In the late-morning, jump on your ATV and head south of Hanga Roa where your adventure begins. Stop at every place you see that looks interesting. Stopping points will be well marked with signs so you don’t have to go searching or feel like you’ve missed something. The roads are well paved on this route. 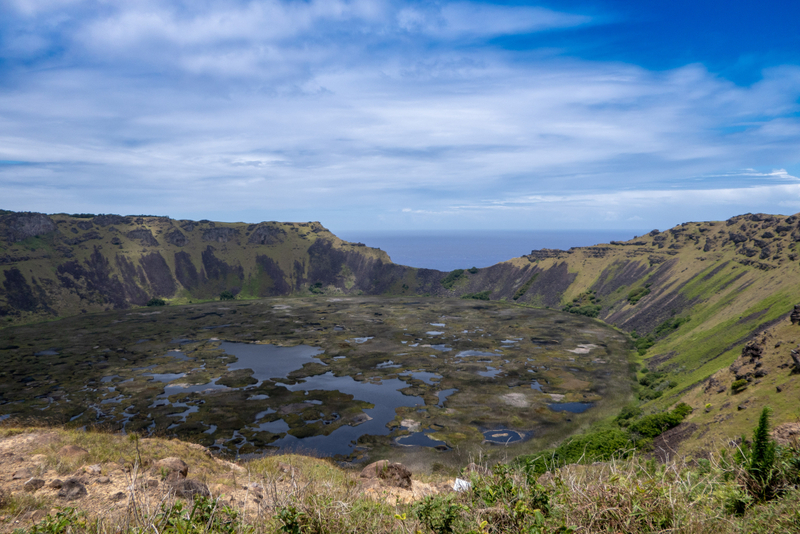 Head around the airport and up to the peak of the volcano caldera on the south part of the island. Add two hours to hike the trail if you feel up to it. Then head back into town. Take time to relax and unwind. Find a new place to eat for dinner. Head over to watch the beautiful sunset again. Then back to your room to catch up online before turning in for the day. 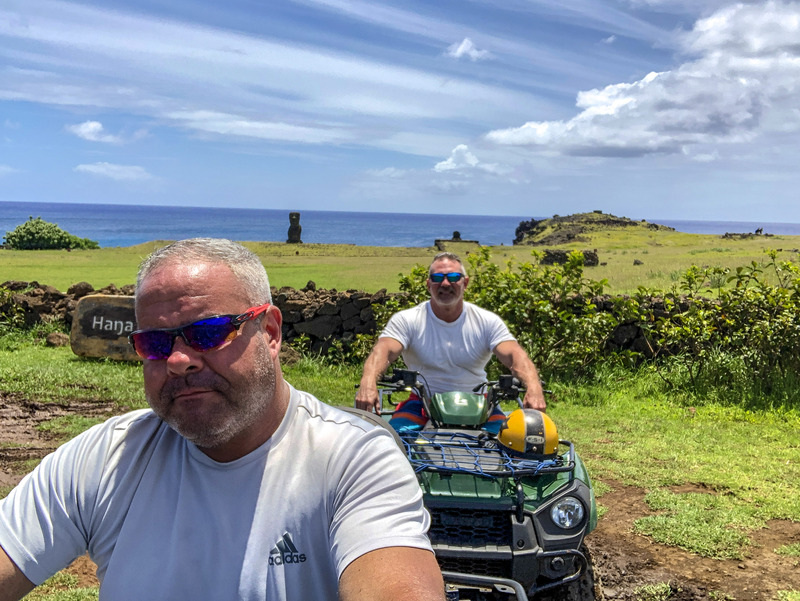 Day 3: Back on the ATV, this time up to the northwest part of the island. The roads all dead-end up here so you can’t make a huge loop around. Think fork tines. Go up one fork and back down. Then up another fork and back down. 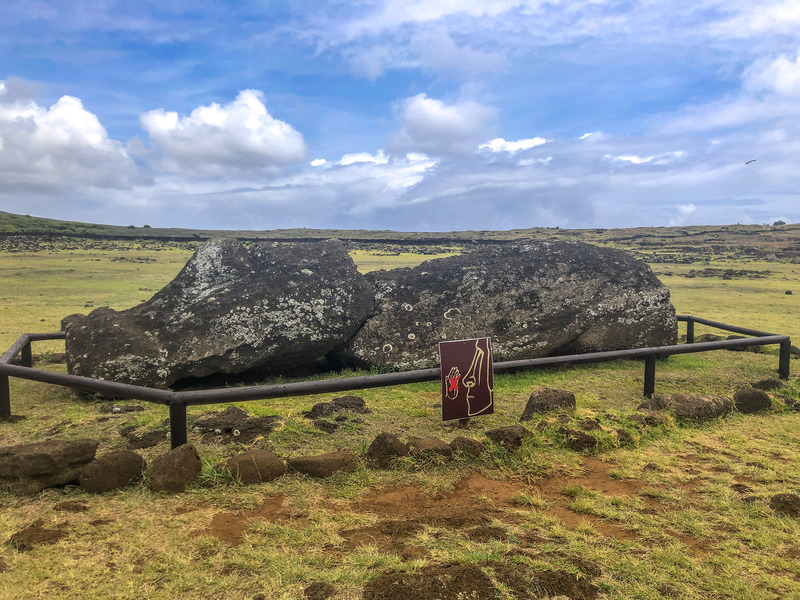 There are just enough Moai and places to see for the late morning and afternoon. You’re close enough to town to go back at some point to eat lunch and head back out again to go up another fork. When you’re finished, head back to relax, watch the sunset, grab dinner, catch up with some Wi-Fi, and head to sleep. Day 4: This is your big all-day trip. 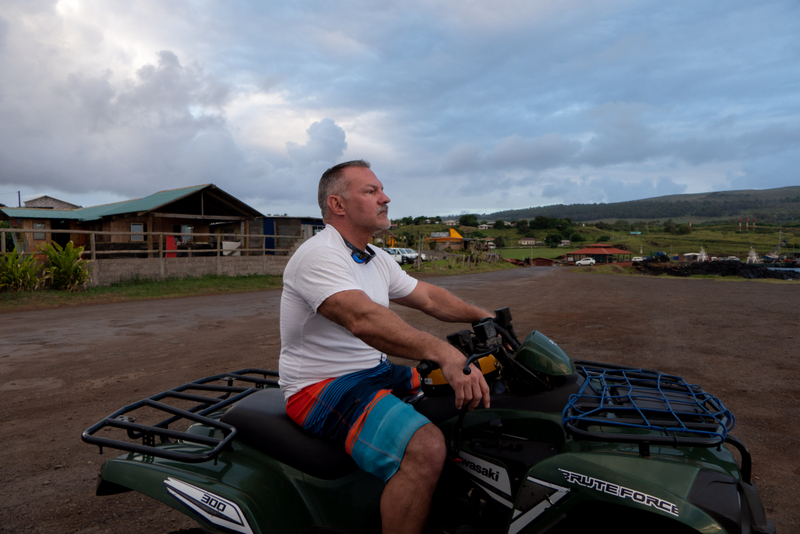 Make sure you gas up your ATV before leaving town as there are no gas stations outside of Hanga Roa and you’ll need a full tank. Pull out the map, and head out early. You’re going straight up the center of the island towards Akenada on the north shore. At the mid-point all the way up the island there are bathrooms and a restaurant for lunch. Then you’re going to loop counter-clockwise back down the east side of the island for the afternoon. 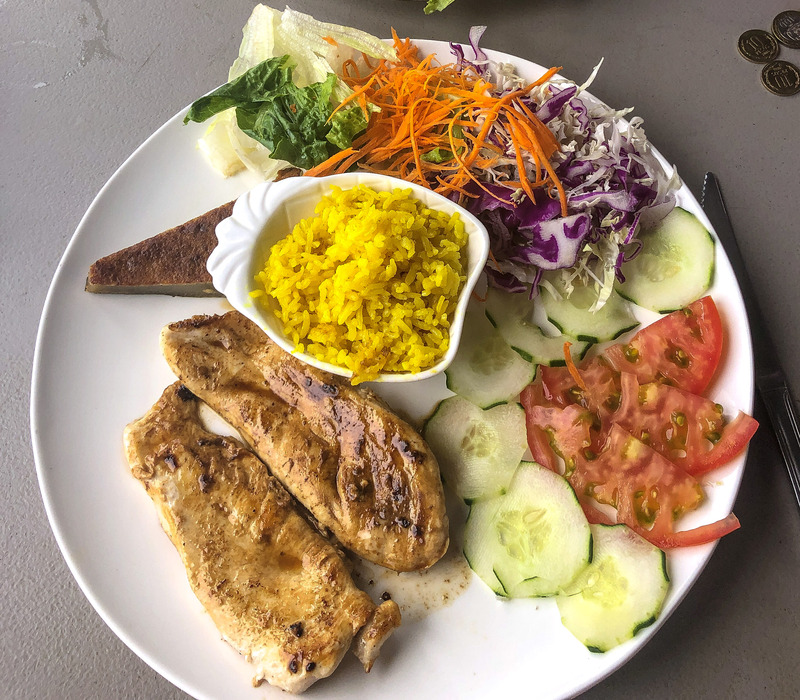 Be sure to hit the small café store next to the bathrooms at the restaurant to replenish your water and snacks before heading out on the back half of the return journey to Hanga Roa. Get back to town and you know the drill now: Relax. Dinner. Sunset. Wi-Fi. Sleep. Day 5: You’ll be departing at 11:45 AM. You need to be at the airport at 9:45 AM. An entire 787 full of people will go through check-in and security this morning at a tiny airfield, so give yourself the full two hours. This means waking up around 7 AM, trekking out somewhere close for breakfast, followed by returning your ATVs. Then head back to the hotel to pack up before getting your ride to the airport. 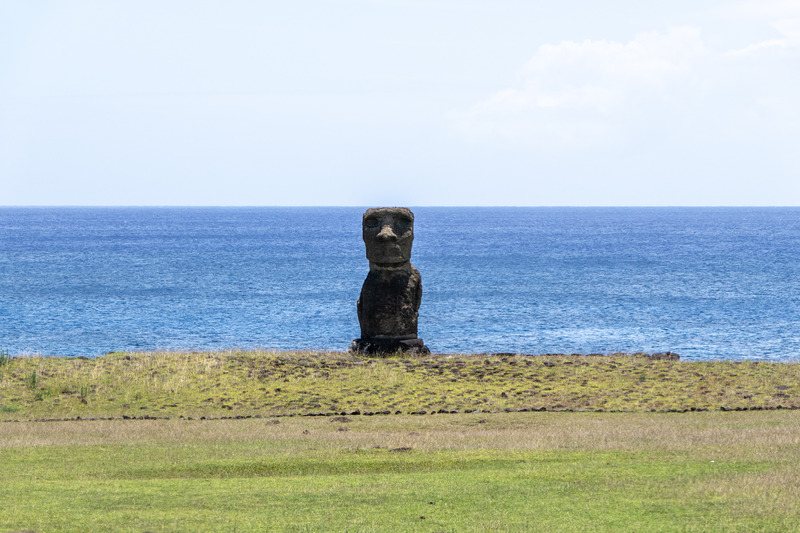 Food Tips: Starting with the section title, tipping is not customary on Rapa Nui. No line to even write it in on the receipt. You pay what is charged and that’s it. Hanga Roa has a surprisingly high number of restaurants for such a small population and remote Pacific island. Very surprising. For each of your days there, you can and should find a new and unique place to eat for each breakfast, lunch, and dinner. Try not to return to the same place twice – except maybe Tiare Café for breakfast thanks to their free Wi-Fi. 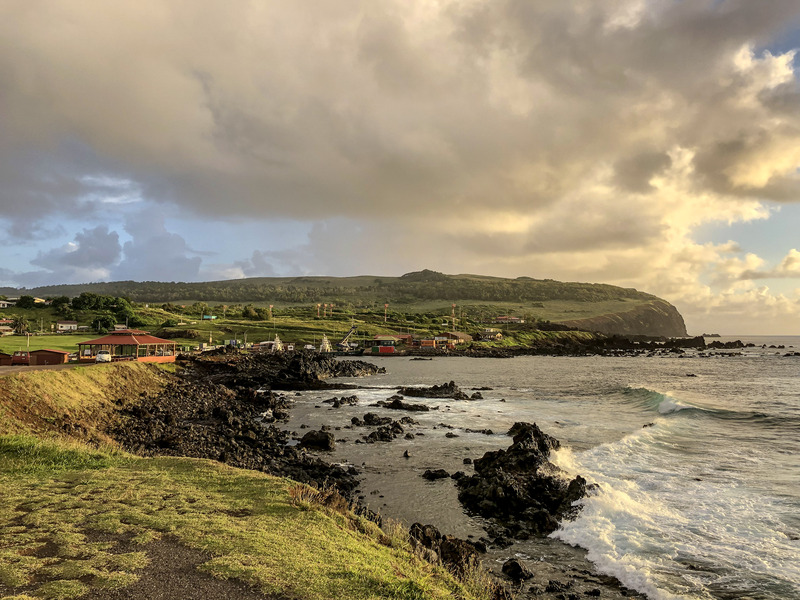 On the road up to sunset point in Hanga Roa – where you will head every evening like everyone else – is the once place we ate dinner twice. I can’t remember the name but will edit this back in later. It’s hard to miss really, right on the left mid-way to sunset point with generous outdoor seating. They have great grilled chicken and french fries with killer views plus reruns of old school MTV video music awards playing on the huge flat screen in the wall. Remember no television. So chow down with a healthy dose of ocean views and a mid-80’s Tina Turner live performance of The Best and Better Be Good To Me. Yum! Accommodation Tips: There are no big-name brands on the island. They’re all local mom-and-pop hotel rooms, guesthouses, and bungalows. Think: Provincetown. Make sure you’re clear on what is included and what isn’t and hotel rules. There are only two places on the island (out of two dozen) that have air conditioning, so if that is important to you, your list just got real narrow real fast. It’s Chile and it’s very remote, but it’s not a third world country. You’ll be comfortable with hot running water, a clean and comfortable bed, and daily housekeeping, But nothing like 4 or 5 stars back home. The infrastructure simply can’t handle that compared to other remote Pacific islands – like Tahiti with its 90,000 people. The best you’ll get is 2.5 (maybe 3.0) stars anywhere, regardless of the rating they have on the internet. Set your expectations low when you go in at the beginning and you’ll be surprised. Have high expectations and you’ll get them crushed. It’s one of the travel golden rules. There is one daily flight so most places will pick you up at the airport with a sign with the names of everyone at that same hotel who are checking in from the single island arrival. Transportation Tips: Bicycle, moped, ATV, pickup, or SUV. You have a choice. The island is too big to bike it in ~3 days and the far north isn’t feasible in a whole day if you include time to stop and see some Moai. And let’s face it, nobody REALLY likes camping unless they’re simultaneously less than an hour away from high-speed internet, indoor plumbing, and a Starbucks. Right? Exactly. SUVs are available but too big to maneuver in a couple places. Your sweet spot is right at moped or four-wheel quad ATV. The quad ATV was awesome, and I would do the exact same one again in a heartbeat. There are a half dozen rental places on the main street in Hanga Roa. Pricing is per 24-hour time period and approx. $60 per 24 hours per ATV. So three days for $180 USD. Just be careful there is no insurance on the island at all. You hand them $180 for an ATV for a couple days and they hand you keys. Wear a helmet and try not to kill yourself. You break it, you buy it, and that includes flat tires and any damage to the quad, or something or someone else. There’s one way off that island, once a day. You don’t want the police showing up at departure time to take your passport until you can come up with the money to pay, and you aren’t leaving the island until you pay. Airfare Tips: Check out business class pricing on the flights to and from Santiago. Business class seats were only a 15-20% markup over economy. This isn’t a “business route” by any means so the markup isn’t gigantic, but the product is the same as any standard business class today. For that small premium you get a fully lie flat seat with great service. If you only do it in one direction, get it on the return from IPC (Easter Island) to SCL (Santiago). You’ll appreciate the comfort much more when you’ve had three or four days on the ground in a less developed island. Back to the airport in Santiago, the departure for Easter Island is hard to find. It’s a Chilean domestic flight that departs form a hidden terminal located half way between the domestic terminal and the international terminal at SCL. You also must complete a separate “Easter Island Visitor” form and hand that to the immigration folks before you are permitted to go through security and board. Be thorough, because they are. National Park Ticket Tip: You must have a National Park ticket in order to get into two parts of the island, one up north and one down south. They’re about $50 and good for two weeks and available at the ticket office located next to the Cruze Verde pharmacy. Look for the signs. They aren’t tied to your name so if you lose it you must buy another one. They also weren’t adamant in checking tickets at the various points. You could get by without one in practice, but really, just give the Chilean people the $50. They need it to support the economy and your tourism on the island. Entertainment: There’s not much so keep your expectations low. 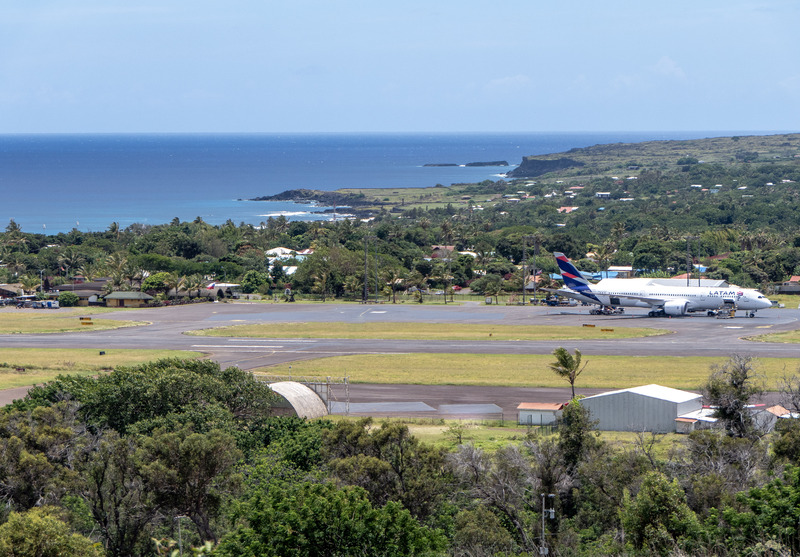 Rapa Nui doesn’t have bars or clubs or even that many “attractions” per se. You’re basically responsible for providing your own good time and exploring the island each day. You make your own schedule and determine how much fun you have independent of everyone else on the island. Dinner was the highlight of social interactions each day by going to new and unique places with great outdoor seating, good breezes, and clean clear sky each night. Make sure you keep tabs on rules of various accommodations. This is important. For example, dishwashing in the kitchen of our hotel room wasn’t included in the price of the room. Every hotel that provided a fridge and sink and glasses obviously included washing the dishes each day as part of housekeeping. Not here. Another example is that one of the white towels got a too dirty and the hotel said they couldn’t clean it good enough, so it would need to be replaced at our cost ($20 USD). There was an itemized three-page list of every item in our room along with associated price posted on the wall. You break it or take it or use it too much of it and you pay for it. To be fair, this was clearly listed on the rules given during check-in so pay attention. Ask for beach towels, don’t use bath towels. Treat your room and their property as it was your own home. Remember you’re in the middle of the Pacific on a small remote island. It takes a considerable amount of work to keep things running from day-to-day. The hotel staff can’t simply go down to the corner Bed, Bath, & Beyond for new towels when replacements are needed. You must wait weeks to get them shipped from the mainland. Keep this in mind all the time. We also had the gas siphoned from both of our ATV gas tanks in the middle of the night the last evening. That made for a hectic return timeline. Running out of gas, leaving an ATV on the side of the road, trying to make it back to a gas station, buying a gas can, getting gas, and getting the ATV back when none of this was planned. To be fair again, we probably should have parked our ATVs around back of the hotel and not right out front on the street. Fine. Lesson learned. 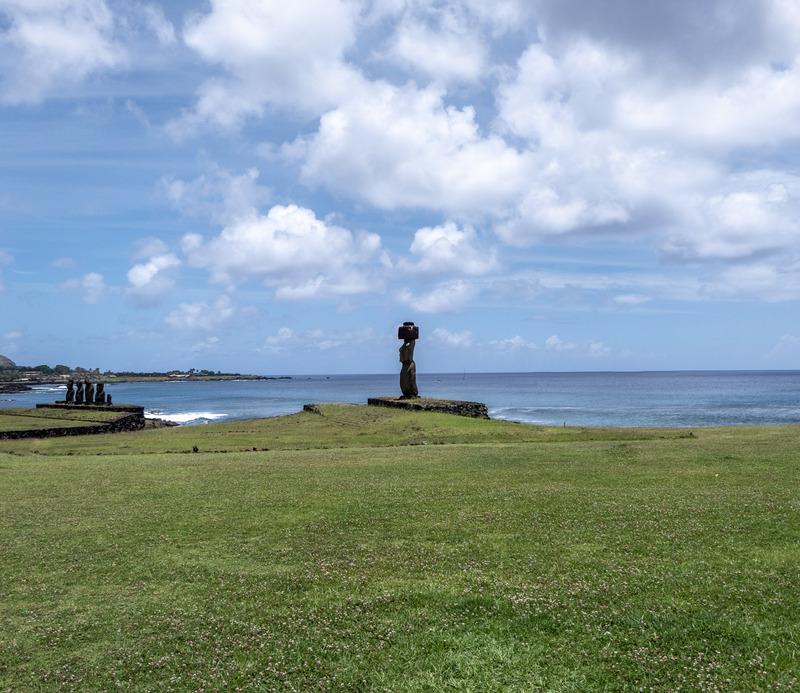 Easter Island (ahem… Rapa Nui) was spectacular. The sunsets were beautiful. The food was good and plentiful. The service was a bit slow but that’s expected almost anywhere outside our fast paced “gotta make good tips” style in the USA. Looking back, the gas siphoning part will just make for a good story down the road. So, get out of your house and go visit some Moai. When you stand there and realized they were carved by hand with pure manual labor some 10,000 years ago by people who had nothing better to do with their time and a couple ideas, you’ll appreciate your Netflix and grande iced half skim no foam mocha latte just a little bit more.